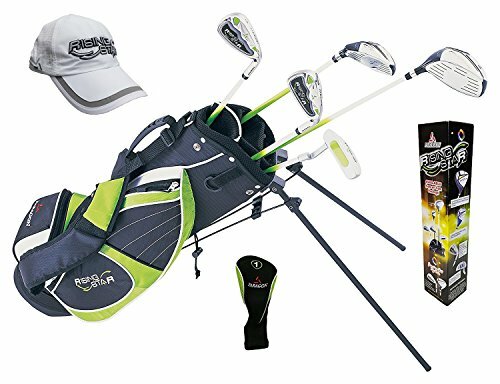 PARAGON RISING STAR JUNIOR CLUBS: THE PROVEN CHOICE, YEAR AFTER YEAR It's time to get junior a set of quality clubs providing solid performance, customized fit, and great feel - and there's no better choice than Paragon's Digest Gold Medal winning Rising Star Junior club line! This is a newly updated set of junior clubs building on the Rising Star legacy, which includes a Digest Hot List medal for over six years! The clubs undergo a top-to-bottom redesign, with a larger 340cc titanium matrix driver for enhanced stability and distance, a specialized hybrid long iron for tough fairway shots, oversized low center of gravity irons for maximum forgiveness, and an easy-to-align mallet style putter. You simply can't go wrong with this set. IT'S ALL IN THE FIT. Get your children started right. The right size, the right shafts, the right clubs. Professionals will tell you from the start that children need clubs that are specifically designed for them. This is done not just by age, but they also must be measured by size in the proper manner. Nothing is more frustrating for a child than trying to play with the wrong size clubs. Our Rising Star Junior Clubs assures each and every child a proper fit. From ages 5-7, 8-10, and 11-13, Paragon offers the best fit, best playing, best priced junior sets in the industry. (See Fitting Chart below) Available in right and left hand in all age groups by the set or by single clubs. Includes 5 clubs: oversized driver with matching headcover, #5 hybrid, #7 iron, #9 iron, and mallet putter. Durable bag with kick stands, includes removable rain hood. Available in both right and left handed configurations.